Socialist Equality Party candidate Niles Niemuth campaigned yesterday in Ann Arbor, Michigan, collecting signatures to get on the November 6 ballot as a candidate for Congress in the 12th district. 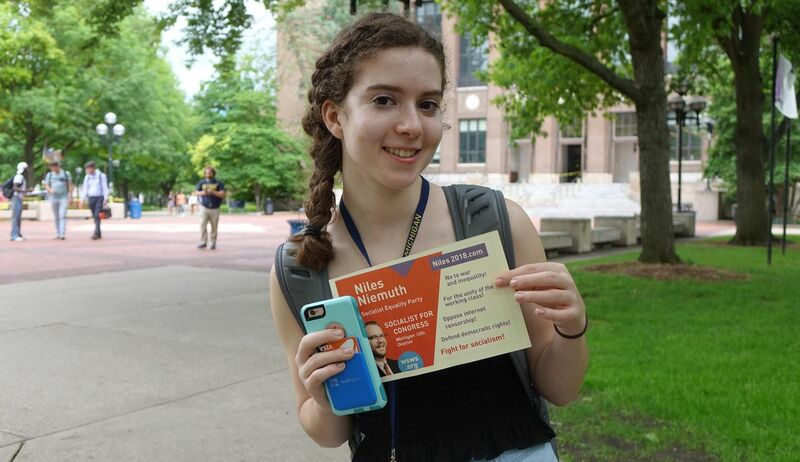 Niemuth spoke with workers and students at the University of Michigan’s Ann Arbor campus and collected more than 100 signatures in support of the campaign. Madeline is turning 18 in September. She was one year old when the September 11 terrorist attacks occurred, which were used to justify an eruption of US wars in Afghanistan, Iraq and across the Middle East and North Africa. “I’ve grown up with global war,” she said. “I know nothing but constant conflict. This is totally unnecessary. I don’t know why we’re continuing the conflict. There’s no reason to bomb and displace innocent people. And besides all the killing, this money could be used for so many things. Flint still needs clean water. We have to repair for [Hurricane] Maria,” in Puerto Rico. The SEP is continuing its campaign to secure ballot access in the November 6 elections on the basis of a socialist and internationalist program. We urge all those who wish to support the campaign to get involved today.